With first quarter earnings season shifting into high gear (50 companies reporting the week of April 15), investors will contend with a slower pace of earnings growth in 2019 versus 2018. The difficulty is the fact 2018 earnings saw a significantly higher pace of growth due to the passage of the Tax Cuts and Jobs Act (TCJA) that lowered the corporate tax rate; thus, providing an earnings tailwind for companies. Analyst accounted for this tax cut benefit by revising company earnings higher as 2018 unfolded. As the above chart shows, upward revisions exceeded downward revisions by nearly 3:1 in early 2018. 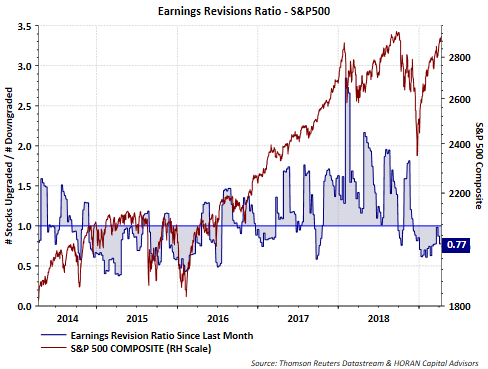 Now, as 2019 is underway, downward revisions exceed upward revisions with the ratio below 1.0. Additionally, first quarter year over year (YoY) earnings growth is currently estimated to be negative at -2.5%. In large part, the negative YoY growth rate is the result of the spike higher in earnings growth last year as a result of the TCJA. The below bar chart shows this spike. The light blue bars are estimated YoY quarterly earnings growth rates. 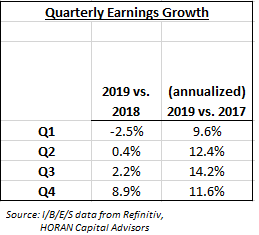 If one compares each quarter's earnings growth rate in 2019 to the comparable quarter in 2017 though, on an annualized basis, earnings growth is mostly double digit. 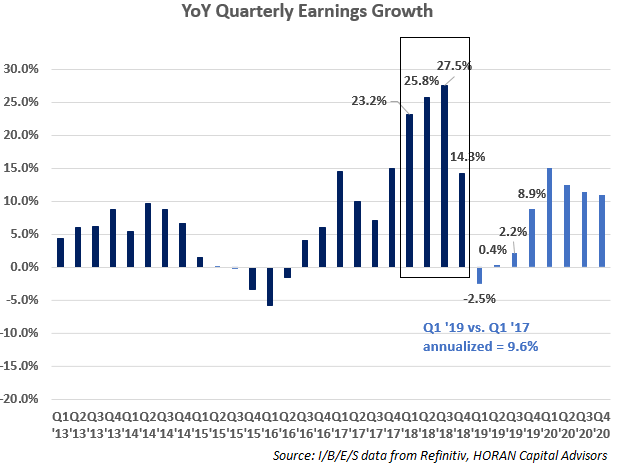 In fact, Q1 2019 versus Q1 2017 annualized earnings growth is 9.6%, far better than the 2019/2018 -2.5% currently expected for the YoY period. The below table shows the quarterly comparison for 2019 versus 2017. For investors then, this double digit annualized earnings growth rate in 2019 versus 2017 is an important variable to keep in mind as Q1 2019 earnings are reported. Certainly 2020 might seem like a ways in the future; however, the expected earnings growth for 2020 is also mid to low double digits. From 2017 through 2020 then, double digit earnings growth would certainly be one factor representative of a positive business operating environment and favorable to stocks. The total return for the S&P 500 Index so far this year is nearly 17%. Stocks do not move higher in a straight line so pullbacks should be expected.